I recently received an invite for a media tour at the BURN factory in Ruiru. You might not be familiar with BURN factory, but you might be familiar with their Jikokoa product. Jikokoa is that cook stove that has Wilbroda of Papa Shirandula on the packaging. Translated, Jikokoa means ‘the saving stove’, and from what I have heard from other women, it saves by using way less charcoal than the regular jiko. However, I wasn’t able to make it for the media tour, but Sylvia Wakhisi, a fellow journalist and very good features writer – who has written for the People and Standard newspapers, was able to take the tour. 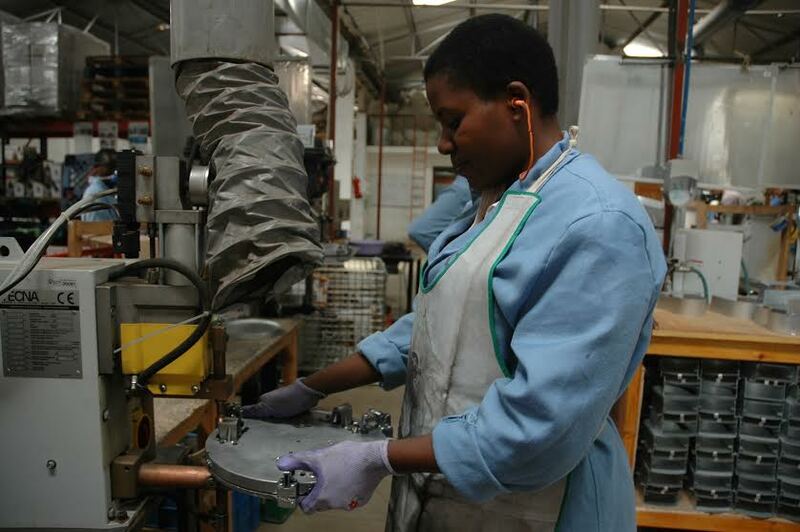 At the factory, Sylvia met some of the women involved in the manufacture of the stove. She spoke to two of them – working mums who toil hard to provide for their children. Sylvia shares their stories with us. 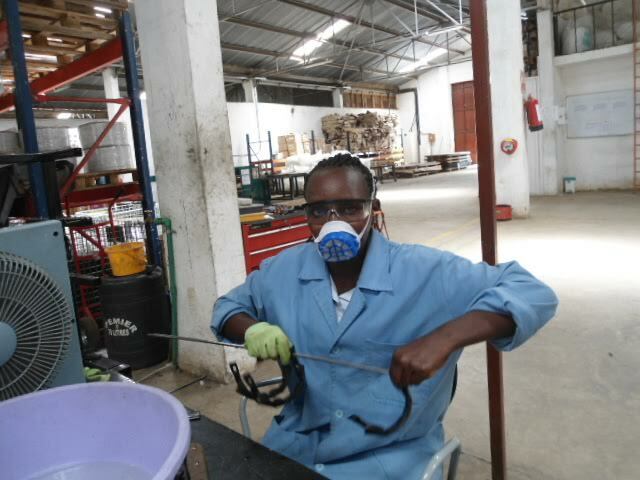 Anastacia Mutoli, a widow and mother of five has been working at the factory since September 2014. In the assembly of the Jikokoa, she deals with the bottom part which is normally placed under the jiko to support the bridge. Anastacia, who previously worked as a house girl and later in a security firm, says she is happy and loves her job as it enables her eke a decent living. “The security firm dismissed me because I was not educated hence didn’t have the papers that were needed for me to keep my job. 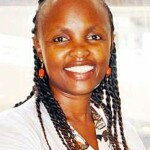 I began the search for another job and when I landed an opportunity to make jiko’s here, I decided to take it up,” she explains. Anastacia reports to work by 7.50 a.m. so that she can be at her work station at 8.00 a.m. and leaves at 5.30 p.m.
“My salary is able to feed, clothe, provide shelter for my children, as well as pay their school fees. 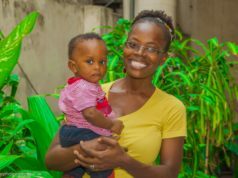 My first and second child just recently joined form one, and that gives me the drive to work hard and educate them because I want them to have a good quality of life ahead,” she says. This is the job that gives Anastacia her bread and butter. Anastacia enjoys working at BURN factory because, whenever she has financial challenges, she is able to get a soft loan from them. Aside from that, Anastacia has enrolled for English lessons at her work place where she and other colleagues are taught how to read and write. 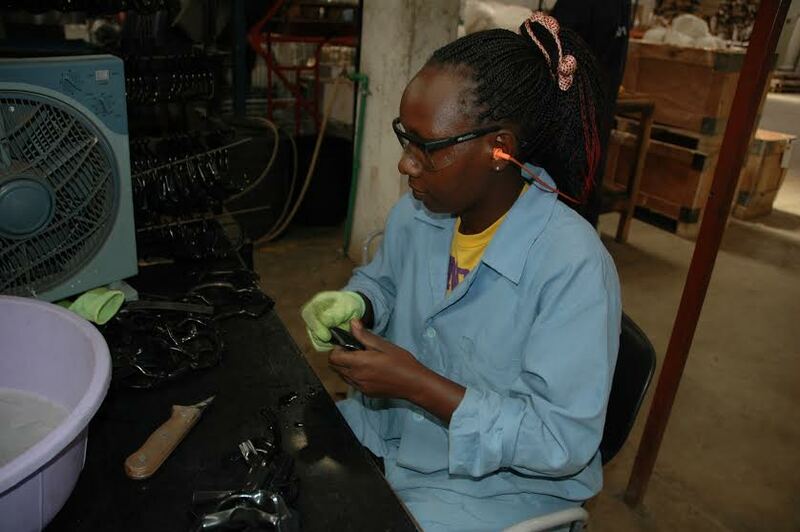 One of the most interesting things about the nature of her work is how people react when she tells them she works in a factory – a factory that manufactures jikos no less. “When I tell my friends that I work at Jikokoa, they become surprised and shocked because they feel the work involved is heavy and hard. They feel it should be a preserve of the men folk. But I always tell them that it’s better than doing nothing,” she says. 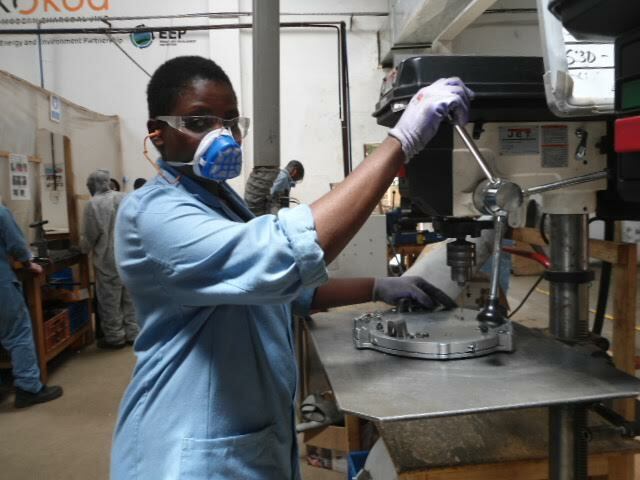 Pauline Mawia, a mother of one, has also been working at the factory since August 2013. Her specialty is handling the slip handles-astry and side body handles- and making sure that they are in good form before they are fixed on the jiko. “My typical working day starts at 8.00 a.m. and ends at 5.30 p.m. I am normally given a target which I have to beat. For the astry handles, the target is 550 per day while for the side body handles it is 1,100 per day,” says Mawia. Is Pauline satisfied with her job? “I must admit that this kind of manual work is not for the fainthearted. I have a child, and when I was searching for a job, this is what came up and I decided to take it up. At the end of the day, it is my child who matters, and as long as I am able to provide, then I will do whatever it takes,” she says. Pauline is further motivated to work hard because she is putting money aside that will enable her pursue her dream course -Business Management. She believes the salary she is getting will enable her achieve this goal. She has some advice to all women: No job is easy. All I can say is that whichever job you happen to get, undertake it passionately and work hard. The results of this will be evident,” she says.